Floating on a lake over a collapsed coal mine, the power station in Anhui province can produce 40 megawatts of energy. Last week, workers switched on a solar energy plant capable of producing 40 megawatts of power, which floats on a manmade lake in China’s Anhui province near the city of Huainan, reports Sarah Zheng at the South China Morning Post. 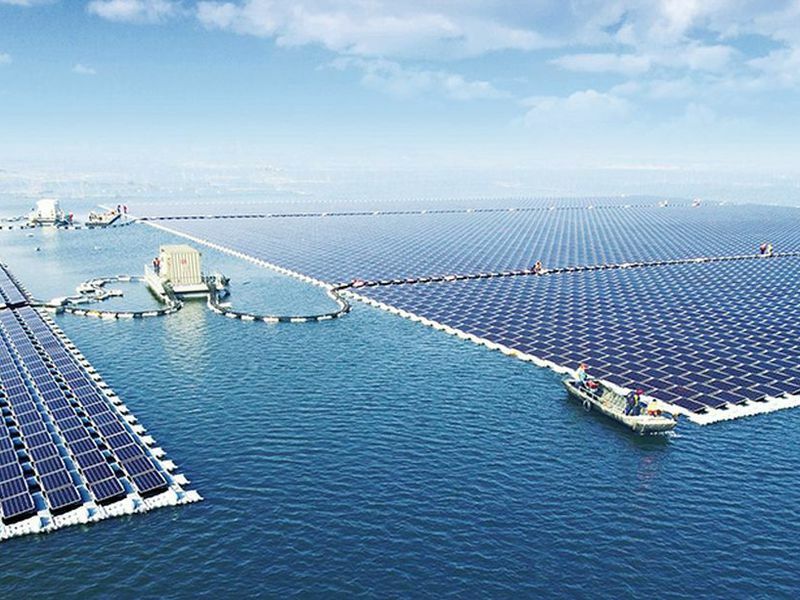 The array is the largest floating solar project in the world, though at the brisk pace China is building new renewable projects it’s unlikely to hold that title very long. Built by the company Sungrow Power Supply, the power plant will produce enough energy to power 15,000 homes, Zheng reports. While the company has not revealed the exact size of the operation, it produces twice as much energy as the previous holder of the largest-floating-solar-plant title, which is located in the same area and was launched by the company Xinyi Solar in 2016. Anhui province is a coal-rich region, and the Sungrow plant is located on a lake that was once the site of intensive mining. Heavy rains filled the area with water. As Zhen reports, the depth of the lake varies from 12 feet to 30 feet. So why build solar plants on top of lakes and reservoirs? Fiona Harvey at The Guardian explains that building on bodies of water, especially manmade lakes that are not ecologically sensitive, helps protect agricultural land and terrestrial ecosystems from being developed for energy use. The water also cools the electronics in the solar panels, helping them to work more efficiently, reports Alistair Boyle for The Telegraph. For similar reasons Britain built a 23,000-panel floating solar farm on the Queen Elizabeth II reservoir near Heathrow airport in 2016 to help power the Thames Water treatment plant. The Sungrow solar farm is just one tiny piece in China’s push towards renewable energy. According to Irina Slav at Business Insider, the country recently announced it would invest $361 billion in renewable power by 2020, and by 2022 could produce 320 gigawatts of wind and solar power and 340 gigawatts of hydropower. Zheng reports that currently renewables are responsible for 11 percent of China’s energy and may reach 20 percent by 2030. While the floating solar plant is the largest in the world, it pales in comparison to some of China’s non-floating solar projects. The Longyangxia Dam Solar Park on the Tibetan plateau hosts 4 million solar panels that produce 850 megawatts of energy. Even that will soon be eclipsed by a project in the Ningxia Autonomous Region, which will have 6 million solar panels and produce 2 gigawatts of power.